Installed amplifier systems in London theatres - Dominion, Coliseum (120W) and Drury Lane (60W, for Noel Coward’s “Cavalcade”). Installed a 200W public address system at White City stadium, Empire Pool Wembley (120W), and other stadia. “Bunched” speakers with narrow beam-width. Launched “Pamphonic Baby Reproducer” (also known as the “Standard Pamphonic Reproducer”) 18W, Marconi Pickup, Garrard Induction Deck, Epoch cinema loudspeaker. Launched “Junior Paramphonic” radiogram with separate speaker. 25W, £160 gns. Launched “Senior Paramphonic” twin turntable radiogram with separate speaker. 50W, £250 gns. “Tone Filter”. Tone & impedance corrector for (Telefunken) pickups. 4 gns. New “Reproducer”. 20W into a 16” speaker. DO24 output valves, 65 gns. 500/501 20W amplifier. 40Hz – 14KHz +/- 1dB. 904V, TT4, AC/P1, 2x D024. 503/504/505/506 portable PA and record deck using 500/501 amplifier. 513 microphone mixer/pre-amplifier. EF5, EBC3. 120uV in, 10V out. 509 dual turntable unit using Garrard RC1A Automatic Record Changer. 512/80 80W Output stage. Mullard MZ05/60 output valves, Mullard RG1/250 mercury rectifiers. Universal Amplifier (ac/dc PA set) 20W, 2 speakers, microphone. 26 gns. 601A PA Amplifier. 25W (3x SP41, 2x EL35, 2x FW4/500). 52 gns with speakers and mic. 601B PA amplifier. 25W (3x EF37, 2x EL34, 2x IW4/500). £27. 10s. 53½ gns with speakers and mic. 602/A 50W “Transportable Amplifiers” (PA). (2x EF37A, EF37, ECC35, 4x EL37, 2x GZ32). £34. 600/A 10-12W (2x EF37A, 2xECC35, 2x KT61, GZ32). £18. 606 Radiogram 10W (4x EF36, 4x EL32, 2x 1D5). Tuner model 606RH from Pye (possibly based on the Pye 15A radio), Garrard RC65 Deck, Garrard cartridge. Pye Ltd acquired 51% of Pamphonic Reproducers Ltd and provided futher cash for operations. 607 Table Radio (Pye 15A SW/MW/LW chassis inside, but painted red not blue). Bow-fronted walnut veneer cabinet with twin doors. “Westmoreland” single cabinet record player. 15W output. 1002A Preamplifier (2x ECC40). 40 gns with 1002 amplifier. New sales offices and showroom opened in Stratton Street, Mayfair. “Pam” name started to be used for some Pye-sourced equipment, including TVs. Edgar Lavington helped Pye launch their Pamphonic-designed PF9i amplifier and PF9iA preamplifier. 40 gns. Pye acquired remaining 49% of Pamphonic. Paul Taylor stayed on as MD. Bowyer Lowe (Pye) took over running of Pamphonic while Paul Taylor was ill with TB. Pye designed and launched the Pam 710 transistor radio. The first British all-transistor radio. £22. 14s plus £8. 15s. 3d purchase tax. PA amplifiers and loudspeakers for “The Story of Woburn” son-et-lumiere. Service department at Honeypot Lane, Stanmore. 3000 Stereo integrated amplifier. 2x 7.5W 30gns. £31. 10s. (2x ECC83, 2xECL82, EZ80). The very first stereo integrated amplifier in the UK, before the stereo record standard was even finalised. 600 Loudspeaker (PA) amplifiers supplied to Post Office Telecommunications for use in repeater stations. PA System for “My Fair Lady” at the Theatre Royal Drury Lane. First UK demonstration of Stereo “Discs” by Pye. Waldorf Hotel London. Pamphonic 3000 amplifier and Victor loudspeakers. 600W 10W integrated PA amplifier. Same style as the 3000/3001 integrated HiFi amplifiers. Pye-Ling founded as joint venture with Ling-Temco-Vought of USA to consolidate vibration equipment product line manufacture (Royston, Herts). Pamphonic bought Reflectograph tape machine line from Multimusic (Multicore Solders & Bib Tape accessories) but closed it within a few years. 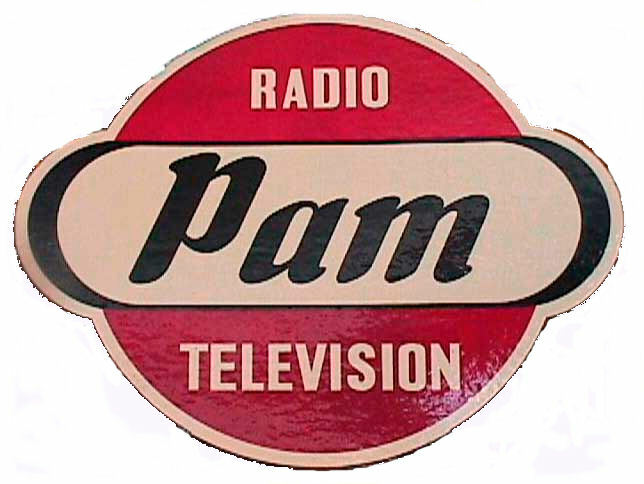 “Pam” branded radio and television sets were sold widely. Reflectograph Model A tape recorder. (2 track record and playback) 3¾ and 7½ ips. Inbuilt amplifier. Pillar (eg “line source”) PA loudspeakers demonstrated at London International Audio Festival. Pamphonic and Pam brands vanish from the market. W Bryan Savage still making vibration systems in Royston. Philips bought controlling interest (60%) in Pye. Patented Line Column Speakers installed in Westminster Abbey, designed and overseen by Paul Taylor, installed by Pye Business Communications.